It�s been a little over a week and finally I have access to the web to post on my blog. A lot has happened during our past 10 days in India. On January 19th, 2006, Trent, Patrick and I departed from George Bush Intercontinental Airport in Houston, Texas. With all our camera equipment and personal belongings we proceeded to check in only to find that our luggage was overweight. Bummer, but after getting rid of some underwear we made it through. Like everyone else we went through security checkpoint which turned out to be quite an experience. With our carry-ons and shoes going through the x-ray machine, we were all s and laughter until I went to put on my shoes. There was a dead baby lizard in it. I gave off a loud scream and everyone stopped what they were doing. Yikes, shouldn�t have done that. I looked over at Patrick and Trent who looked worried as if I was going to get in trouble but luckily airport security started joking with me, and laughing at or should I say with me. I hate to say this but I think it traveled all the way from my house to the airport as I had kept those shoes outside. Poor lizard. The first leg of the trip from Houston to Amsterdam took 8 hrs. We slept for the most part since it was night for us. Once we reached Holland, where we had a 3 hour layover, we decided to venture around. To our surprise all the airport shops and restaurants were written in English, not Dutch and English, but just English. We were a little taken back by it, as I clearly remember the days when it used to be in both languages. We arrived in Mumbai at 11:50 pm on the 20th. Greeted by the humidity and the smell of sweat we proceeded towards passport control. This time everything was written in Hindi. It took us about an hour to get to the exit, where we were graciously welcomed by Jaisita, with whom we�ll be staying for the next 3 months, and her daughter. For those who are not aware, Jaisita was my social worker back in 1978 and the one who connected me with my family. After a thirty minute drive it hit me that I was in India. 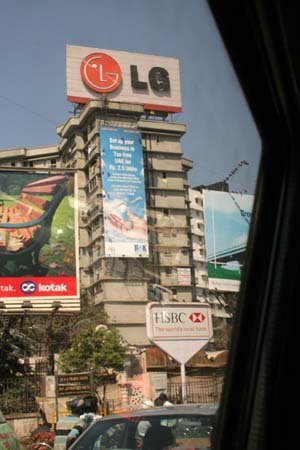 Driving through Mumbai we passed high-rises, slums, people, and a lot of traffic. 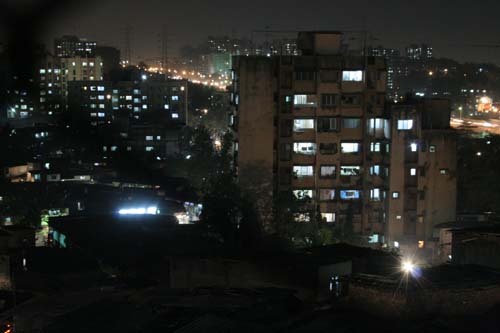 Finally we reached the Raheja Complex in Malad East, which is where Jaisita lives. 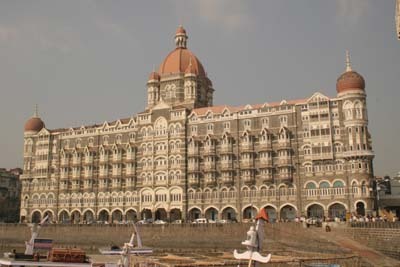 It�s on the outskirts of Mumbai. Her flat consists of two apartments merged into one. Trent and Patrick stay in a guest room together and I stay at the other end next to Sanjukta�s, Jaisita�s daughter�s, room. At the moment parts of Mumbai are going through a drought, including Malad East. This means that we have running water twice a day from 6 to 9:30 in the morning and again from 7ish till about 10 in the evening. In each bathroom there are two buckets, which are filled everyday so that we always have water. I am reminded of the little things I take for granted back home that are not so little here. But once you get the hang of it showering from a bucket is a piece of cake. Jaisita has been extremely kind to buy TP so that we don�t have to use the bathroom Indian style, as they call it. Most importantly everyone on this trip has adjusted and are enjoying our new way of living. Raheja Complex is a tall building with six floors overlooking Malad East. Our first day in India was a bit of a relaxed day. We were trying to get over the time difference, which is almost 12 hours. We went out for a short ride, just to look around and get a feeling of placement. On Sunday I met my dad�s side of the family for the fifth time in my life. It was such a blessed moment, because this was the first time we all knew English and could finally talk. They are amazing people, full of warmth. Tuesday we went to Bal Vikas (the orphanage) to see all the beautiful children, and to meet with two Indian families who came to pick up their adopted children. The process the parents had gone through up to this point was very different from that of an international family. Indian families are able to take their children home at three months old, while going through the process. International families wait for years and receive their children at one to two years of age. Times have changed however, and as not all adoptions are success stories, extra precaution has to be taken. 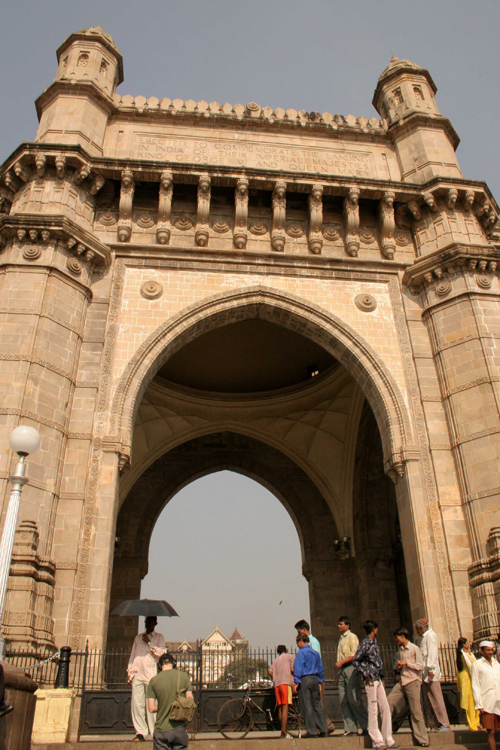 An Indian family will be required to stay in Mumbai until the adoption is finalized and will have to come in for check-ups. The same procedure cannot happen once an international family receives their child, which explains the difference in the process. While I�m out here I will be speaking to several mothers, parents, couples, and social workers to learn more about adoption and the process it takes. Wednesday we went back out to shoot, driving to downtown Mumbai. I realized for the first time that there are not many street signs here, nor are there traffic lights. Though the streets have traffic lanes, no one bothers to follow them, and everyone pretty much drives wherever and whenever they please. Everything is identified by landmarks and I am starting to get a sense of place when I am out and about. 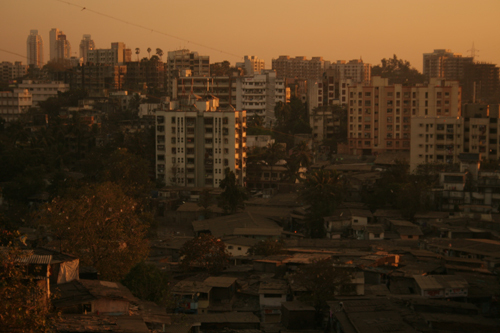 Driving from Malad East on the highway, you see a lot of poverty along the side of the streets in some areas. The difference between being poor and living on the street here as opposed to, let�s just say, the US, is that it is socially accepted by everyone here. No one seems to really bother or make an issue of it. You also realize that you cannot help everyone here though it�s the first reaction that comes to mind. Downtown Mumbai itself reminds me a lot of an up and coming New York City but still not like Dubai which is far more advanced. 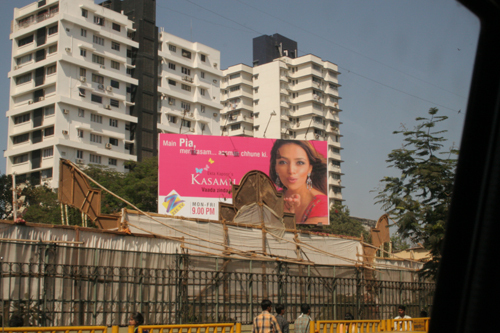 Billboards start to appear the further into Mumbai you go. I have not seen any interactive ones yet, though I have been told that they do exist. The ads are very much like the billboards I see in the States, only featuring Indian people. The branding here is very Western-oriented as well. There is a cell phone company called Hutch (formerly known as Orange for those who know that network) which uses the exact same branding as T-Mobile. I asked if they are affiliated in any way, but that is not the case. Now onto the Great Internet Struggle. I�ve heard that there are Internet caf�s and wireless connections out here, but it must all be in the heart of the city (a fair distance from me) because I have spent days trying to get us connected to the net and to establish a wireless network. At this point I am grateful to finally be able to log on, check email and post to my blog. I am still in the midst of trying to upload work to my site. The PC connection we are using is very slow, so bear with me. 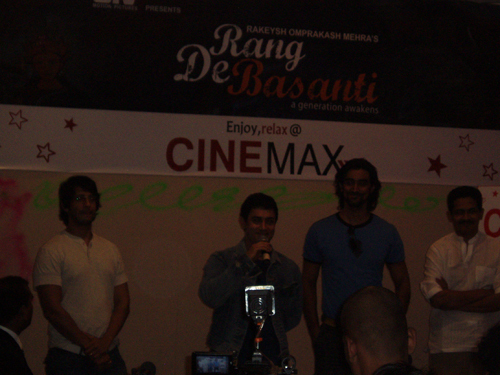 Thursday we went to see a Hindi Movie Rang De Basanti. (For those interested, I bought the sound track and will be happy to share it with you, or purchase one for you, it�s 160 Rs so let me know before I return) Some parts were in English. The movie was three hours long with an intermission. Surprisingly we were all able to follow the film. I highly recommend that everyone see it when it comes to the States. Prior to seeing the film, we all got to see the main actors. It was like a mini Hollywood film premiere and a lot of fun to experience. Friday, we shot some more and went for a drive. I got to see all the call centers that we deal with when calling our service providers late at night in the US. I joked with Sanjukta and told her that we should pay them a visit as I have probably spoken to a couple of them in the past. Of course we didn�t go in but it would have been fun. Sanjukta told me about the training they go through and how many Americans often yell at them. A book � One Night @ The Call Center by Chetan Bhagat � has been written about a night in an Indian call center. Great book, I am bringing a copy back with me. Saturday we were all invited to attend the first birthday of an adopted child who is son of a politician here in Mumbai. I have been told that when a woman is pregnant here, they have a huge celebration when they reach the 7 month mark of their pregnancy and again when the child has been born. Since that goes lost when adopting, a couple will go all out on their child�s first birthday. After ten days here we are finally over jet lag and are able to work on a normal daily schedule. I�ll be posting throughout my stay here. If you have any questions or need more information in detail, and if you know that the subject matter is not something I will be able to post about, please email me. Hej allesammen. F�rst og fremmest vil jeg sige TUSIND TAK til jer som har bes�gt min blog samt har skrevet til mig. Jeg s�tter meget stor pris p� jeres hj�lp. Jeg vil gerne dele min egen historie med jer, siden I har v�ret s� s�de at fort�lle mig om jeres. Jeg var kun een m�ned gammel da min mor eller far i Indien (hvem ved) besluttede sig til at de ikke kunne beholde mig. Jeg blev efterladt p� en togstation klokken ca 3.00 om morgenen, da de vidste at jeg der hurtig ville blive fundet. Rigtig nok.. og jeg blev s� afleveret til b�rnehjemmet Shree Manav Seva Sangh i Bombay. Tidligt om morgenen kom mine danske for�ldre til b�rnehjemmet da de skulle v�lge en lille pige.... mig. (I 1978 var tiderne anderledes og hvis man havde en mor eller far som kom fra Indien kunne man selv tage ud og "v�lge" sit barn. Det lyder h�rdt, men det er sandheden. Min far er inder og m�dte min mor i USA. De forelskede sig, og han flyttede senere til Danmark. 20 �r efter flyttede vi alle til Atlanta, Georgia pga. min far�s job. Tilbage til min historie: Da min mor og far gik rundt p� b�rnehjemmet fortalte Jaisita dem om mig. En lille pige med de flotteste kr�ller! Min mor ville straks se mig, men fik at vide at hun kun kunne se mig men ikke f� mig da jeg var s� ny p� b�rne-hjemmet. It was love at first sight som det ogs� har v�ret for alle jer i DK og for de dejlige b�rn I nu har f�et. Min mor er temmelig st�dig og hun ville absolut have mig. Mor og far rejste tilbage til DK og efter en h�rd kamp lykkedes det. Den 15. August 1978 ankom jeg til Kastrup i Jaisitas arme sammen med 2-3 andre b�rn. Jaisita var lykkelig for at putte mig i min mors arme da jeg havde givet hende hovedpine hele flyveturen ved at stortude. Det er jo noget jeg r lidt af nu. Siden da har Jaisita v�ret i mit liv og fulgt mig gennem min opv�kst. Jeg har altid betragtet hende som min indiske mor og holder hende n�rt ved mit hjerte. To �r senere rejste min mor,far og jeg igen til Indien, da vi skulle ud og finde min lilles�ster, som hedder Natasha. Med hensyn til Natasha var vi frem og tilbage mellem to b�rnehjem og pludselig "dukkede hun op". Min far rejste ud for at hente hende alene da hun var tre mdr. Idag er min mor 63 �r, min far 59 �r, Natasha 25 �r og jeg selv er 27. Mit liv er og har v�ret som en dr�m og jeg er s� taknemmelig for min familie. Min s�ster er nu bosat i Atlanta, Georgia, min mor og far bor i Houston, TX og jeg selv bor i LA, Californien. Vi er bosat langt fra hinanden men taler sammen flere gange om dagen. Jeg er dybt taknemmelig for, at jeg fik min lilles�ster. Vi er rigtig gode venner og hvad ville jeg dog have gjort uden hende da jeg voksede op. Varmeste hilsener her fra USA. Hej og velkommen til min Bal Vikas blog. Mit navn er Sarah og jeg er bosat i Californien i USA. I �jeblikket studerer jeg til en Masters Grad p� en kunst skole der ligger i Pasadena kaldet "Art Center College of Design". F�r jeg startede min videreg�ende ud- dannelse havde jeg altid �nsket at lave en film om Indien og adoptioner, da jeg selv er adopteret og kommer fra Bombay. F�rst i det nye �r skal jeg til Indien og som en del af min research leder jeg efter adoptivforaeldre, som har adopteret b�rn fra Indien og som m�tte �nske at dele deres historie med mig. Jeg har kontaktet www.balvikas.dk som er en organisation i Danmark som st�tter b�rnehjemmet Bal Vikas i h�b om at nogle af jer er interesserede i at fort�lle mig om jeres egne oplevelser omkring adoption. 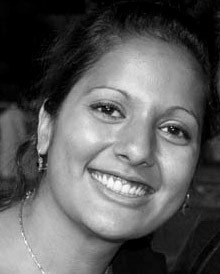 Jeg har kendt lederen af Bal vikas, Jaisita Panigrahi hele mit liv og har m�dt hende mange gange b�de i Indien s�vel som i Danmark, da hun blev en del af familien. Hun vil v�re en stor del af min film. Det vil gl�de mig meget hvis nogle af jer vil v�re villige til at deltage og dele jeres historie og m�ske billeder med mig. Jeg h�ber p� at kunne interviewe familier i Indien, Danmark og USA. S�fremt I m�tte �nske at blive en del af mit projekt, s� skal I blot skrive til contact@balvikasproject.com og derefter vil jeg sende jer en release form som beskytter alle parter. I f�rste omgang er jeg igang med at samle historier fra mennesker som jer. Jeg h�ber virkelig meget at I vil dele jeres historier med mig. Jeg gl�der mig til at h�re fra jer. Der er to m�der at skrive til mig p�. 2) Forneden kan I trykke p� � add a comment � I vil blive bedt om at indtaste jeres navn og email. Skriv i den hvide boks hvor der st�r comment. N�r I er f�rdige tryk p� � post comment� I vil nu kunne se hvad I har skrevet. Hello, and thanks for visiting my blog. I hope you'll find it useful.